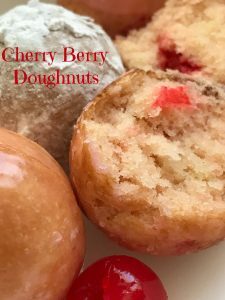 Cherry Berry Doughnut Holes are made in a cake pop maker. I purchased a Bella cake pop maker on one of my thrift shopping adventures. I paid $1.00 for the cake pop maker. What a bargain! It makes great cake pops and fantastic doughnut holes too. 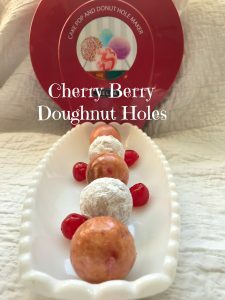 Cherry doughnut holes are the perfect sweet to make for your sweetheart this Valentine’s Day. 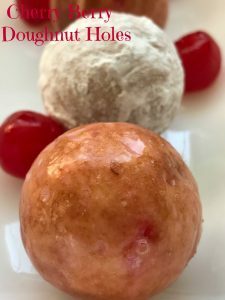 I’m thinking that since these doughnut holes are baked and not deep fried in hot oil, they would have to be “not too bad” for you. 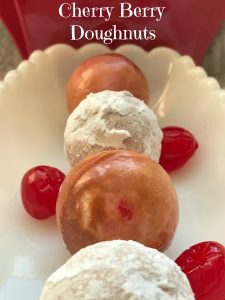 With that thought in mind, I had no problem popping a couple of these yummy doughnuts into my mouth, one at a time of course. I decided to use maraschino cherries, left-over from Christmas, just make sure to drain the cherries well, before and after you diced them. Maraschino Cherry [mar-uh-SKEE-noh] This specially treated fruit can be made from any variety of cherry, though the Royal Ann is most often used. The cherries are pitted and then Macerated in a flavored sugar syrup, usually almond flavor for red cherries, mint for green. Maraschino cherries can be purchased with or without stems. They’re used as a garnish for desserts and cocktails, as well as in baked goods and fruit salads. This recipe is made in a cake pop maker. I purchased a Bella cake pop maker on one of my thrift shopping escapades for $1.00. What a bargain! Plus it makes fantastic doughnuts too. In a separate bowl whisk together milk, oil, strawberry yogurt, egg, and vanilla extract. Pour liquid ingredients into dry ingredients. Using a mixer on medium speed, blend until smooth. Fold in diced maraschino cherries. Fill each cooking reservoir with about 1 teaspoon/1 tablespoon of batter. 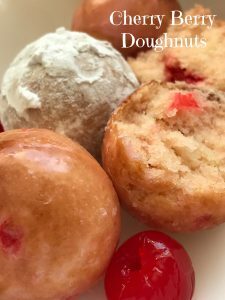 Bake about 2 to 3 minutes (or until a toothpick inserted into doughnut comes out clean) Remove doughnuts from cake pop maker and place on wire rack set over a sheet of waxed paper. Make glaze: In a small bowl whisk together powdered sugar, milk, maraschino cherry juice and raspberry extract until smooth. Drizzle glaze over doughnut holes.